We all wear them and for most of us there are two ways of buying them. You will either buy a little cheaper, being carefree about the life span you can expect from them. Or you buy shirts that are a little more expensive but be happy in the knowledge that with care they will last a little longer. Here lies the point: As with everything in this world if you look after ‘it’, ‘it’ will last longer. The number one mistake a lot of men make is that they buy quality and then don’t look after it. Shirts are made of cotton. It sounds like the most obvious thing to say but sometimes it needs spelling out. If you are a regular business traveller, the chances are you have had to make use of a hotel laundry service or perhaps as a matter of routine, you have your shirts dry cleaned in any case? Unfortunately, while you care a great deal about your shirts, where they came from, how they were made, the cotton that was used – the chances are that your cleaning services are not quite so passionate! To them, it may well just be another shirt that needs washing and ironing. If you can avoid it, don’t dry clean your shirts. Have them laundered. A dry cleaner will use chemicals as part of the dry cleaning process that actually breaks down the fibres of the cotton – making it look older, quicker. To this end have them laundered on a 40 degree wash. When it comes to having them pressed, again, shirts aren’t viewed with the same high regard as you might have for them. Professional pressing machines are often on all day and therefore working at a temperature which is far too hot for the cotton. 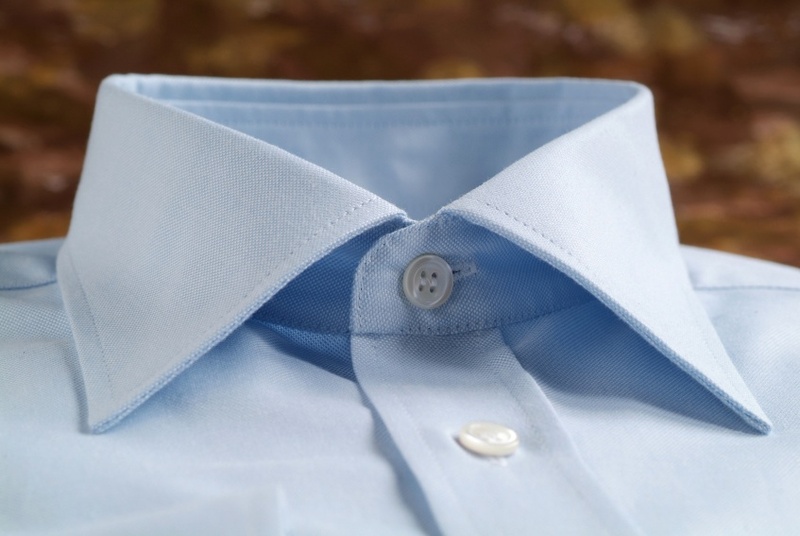 The first aspect that commonly breaks down on a shirt is the collar tip, and with regular pressing at a heat too high it can break down the collar cotton extremely quickly. As a tip: Never is there a need to iron over the collar tips. Iron close to them but away from them in the direction of the centre of the neck. You will find shirts on the high street which are reasonably priced and are reasonable in the short term. But if you are based in London you would do well to visit Jermyn Street, tucked just behind Piccadilly in the west end. In its early days Jermyn Street was more residential than commercial. It was a scene of houses, hotels, taverns and schools, which was dominated by the beautiful Church of St. James’s designed by Sir Christopher Wren. Over the years Jermyn Street’s distinguished residents have included the likes of Sir William Stanley; Sir John Churchill, 1st Duke of Marlborough; Sir Isaac Newton; William Pitt; Sir Walter Scott; the poet Thomas Gray; William Gladstone; and W. M. Thakeray. It now remains as one of the best streets in the world for shirting. With a 300 year history, and inevitably a few changes in its architecture, Jermyn Street has atmosphere and men’s fashion that insures for a quintessentially British experience, and clothes that are regulararly worn by royalty, aristocracy world leaders and celebrities. Turnball & Asser, New & Lingwood and Thomas Pink are all good places to explore. Particularly as they will demonstrate the variety of what is on offer on the street. A typically male way of shopping is to find a brand that fits well and then remain faithful to it. So take the time to find it. All shirt makers will allow you to try on their shirt cuts before you commit to a purchase. Therefore the advice is to try on some shirts from different retailers, and see which one works best for you. There are deals to be had by retailers. 3 for the price of 2, or 3 for £100 are inviting propositions. But if the shirts from that retailer don’t fit you well then it is a false economy to buy them. You would be better off spending more and building up your wardrobe at a slower rate. Jermyn Street sales are worth keep an eye out for. There is one particular retailer renowned for being on sale most of the time. But for the others they will go on sale in June / July to clear the remains of the spring / summer stock; and again in December / January to clear the autumn / winter stock. Do bear in mind that while you might find the odd classic design, the shirts in the sale are likely to be more seasonal in terms of their design.